When the teachers at Clear Creek Elementary school received a grant for $500 to build an augmented reality sandbox, they came to Georgia Highlands College for help. 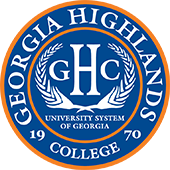 Dean of Natural Sciences and Physical Education Greg Ford said the entire setup for a mobile unit would have cost closer to $2,000, so the Division of Natural Sciences and GHC’s Information Technology Services division put their heads together and got to work. The combined team decided the best way to help Clear Creek Elementary school build their sandbox on the $500 budget was to create everything from the ground up. Natural Sciences worked on building a mobile module, while Information Technology constructed a computer to run the augmented reality program. The end result was a fully functional, mobile augmented reality sandbox for under $500. Augmented reality is any technology that superimposes some type of computer-generated image on a person’s or group’s view of the real world. 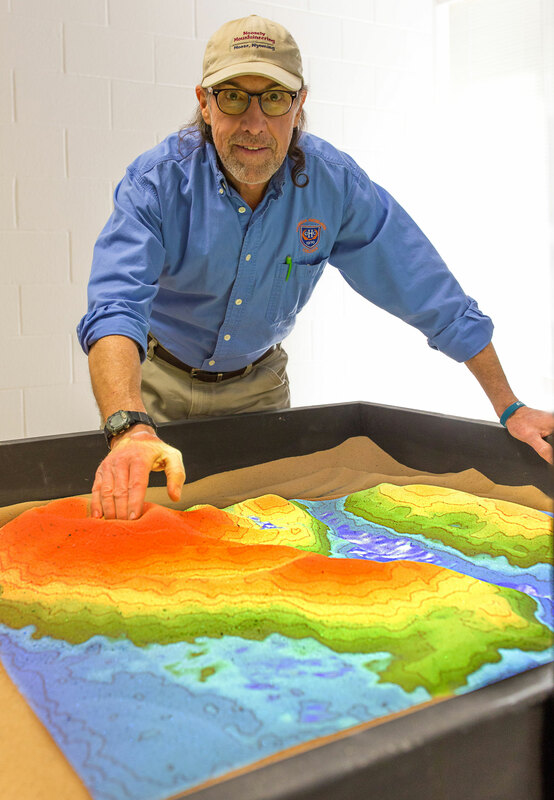 The sandbox allows teachers to create topography models by shaping real sand, which is augmented in real time by an elevation color map, topographic contour lines, and simulated water. In short, if you create a pile of sand, it forms a mountain, or if you dig a deep enough hole, you’ll hit sea level and the hole will fill with water. Teachers can use the system to teach geographic, geologic, and hydrologic concepts, including how to reach a topography map, the meaning of contour lines, watersheds, catchment areas, levees, and so on. Clear Creek Elementary now uses the mobile unit for course exercises in multiple classes. GHC didn’t stop there, however. The team behind the original project came together again to build a larger stationary unit for the college to use in multiple courses. The static unit was recently finished and can be found in a new geology room on the Floyd Campus. It features a much larger projector and image, upgraded graphics card and computer, and has several additional features, including the ability to demonstrate how rain affects a terrain in real time. It is constructed in the center of the room, so students can stand around it. “We can now show our students what science says happens over thousands and millions of years in segmented real time. We can show how you start off with a flat plane, then your plane shifts and forms a hill or mountain, then it rains, the rain pools, and an ocean is formed. We get to show all of that with augmented reality,” Ford said. The departments are planning to bring another stationary unit to the Cartersville site in the near future with plans to possibly build additional mobile units, as well.